Northbrook is a city in Illinois. 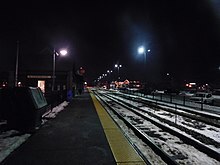 The Milwaukee District/North Line passes through Northbrook and stops at Northbrook station. Bus services are also easy to access in Northbrook, and they can provide a way to get in, and around the city. Getting around in Northbrook is very easy by car, as the entire city is connected by roads. Public transit is available as well. There are plenty of attractions and things to do in Nortbrook. Renaissance Chicago North Shore Hotel, 933 Skokie Boulevard, ☎ +1 847 498-6500, fax: +1 847 498-9558. This city travel guide to Northbrook is an outline and needs more content. It has a template, but there is not enough information present. Please plunge forward and help it grow! This travel guide page was last edited at 10:00, on 25 April 2019 by Wikivoyage user Zcarstvnz. Based on work by Wikivoyage users Traveler100bot, CommonsDelinker, Hiàn, Ground Zero, Ibaman, Madmoons, AndreeBot, Traveler100 and Ikan Kekek and others.